Packing has never been my strong point. I either arrive with far too much, or far too little, and what I do have in my case is never what I really need. But fortunately I found that packing for a running holiday is much easier; three pairs of running shoes, three pairs of shorts, six vests, a load of sun cream, swimming cossie, flip flops, a few dresses, toothbrush, teddy bear (yes, really) and off I can go. No need to co-ordinate outfits or spend sleepless nights wondering what a “capsule wardrobe” actually is. 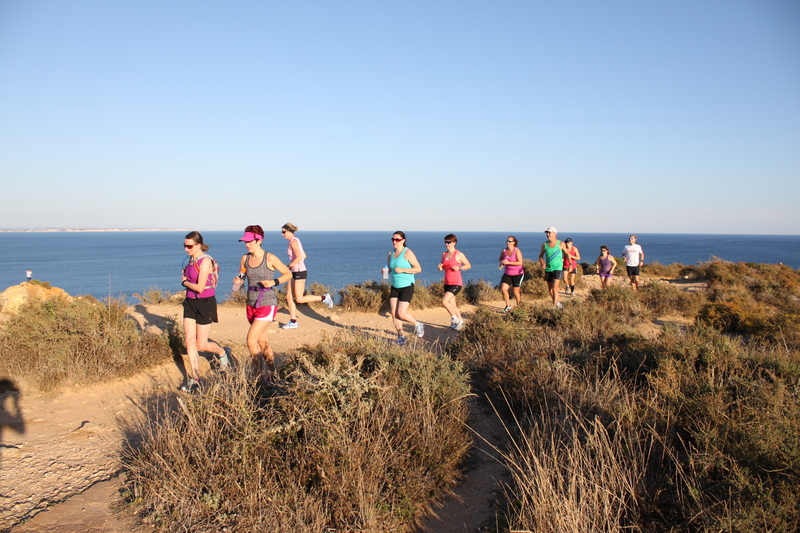 I had booked on to the Embrace Sports October running holiday in Portugal way back in spring. With 188 sleeps to go I had plenty of time to try to explain to friends and family why I was using my first time abroad in three years as a chance to do even more running. Now they have been bombarded with some of the photos and tales of hilarity they understand. And are insanely jealous. On arrival at Faro airport I was greeted by one of our three coaches for the week and some of the other runners. Coffee and bananas were already being consumed, which is a good start as far as I was concerned. Slightly tired and apprehensive, we sat in silence during the hour-long drive to the villas, soaking up the sun and the scenery (Portugal is incredibly green with rolling hills – a real home from home). The complex that we had exclusive use of for the week was just outside of Lagos. 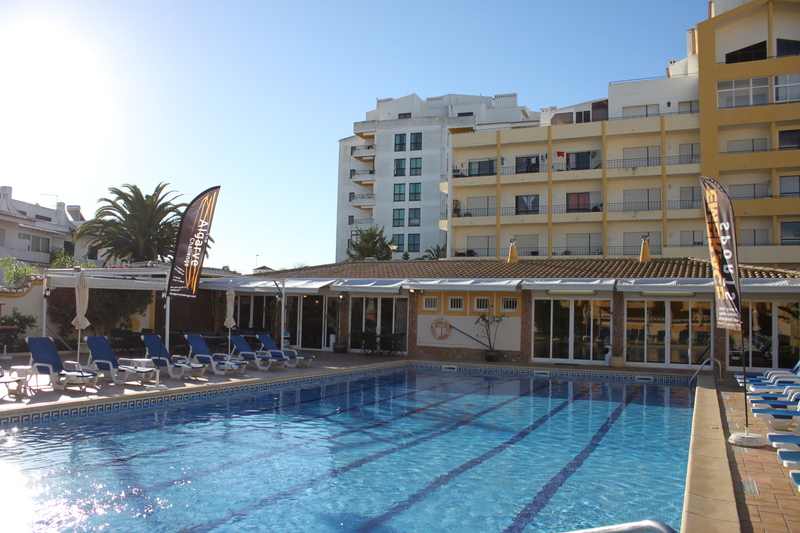 The main area was a walled courtyard with swimming pool and an ample supply of sun loungers, plus a main building with full kitchen, barista coffee machine (heaven! ), pool table, dining area, foam rollers (owie) and so on. Our villas were just the other side of the wall. Each had two bedrooms, plus kitchen with washing machine, lounge with sofas, dining area and a fantastic shower (there’s nothing worse than low water pressure when trying to get sand out of places it shouldn’t be). That first day was all a bit of a happy daze. 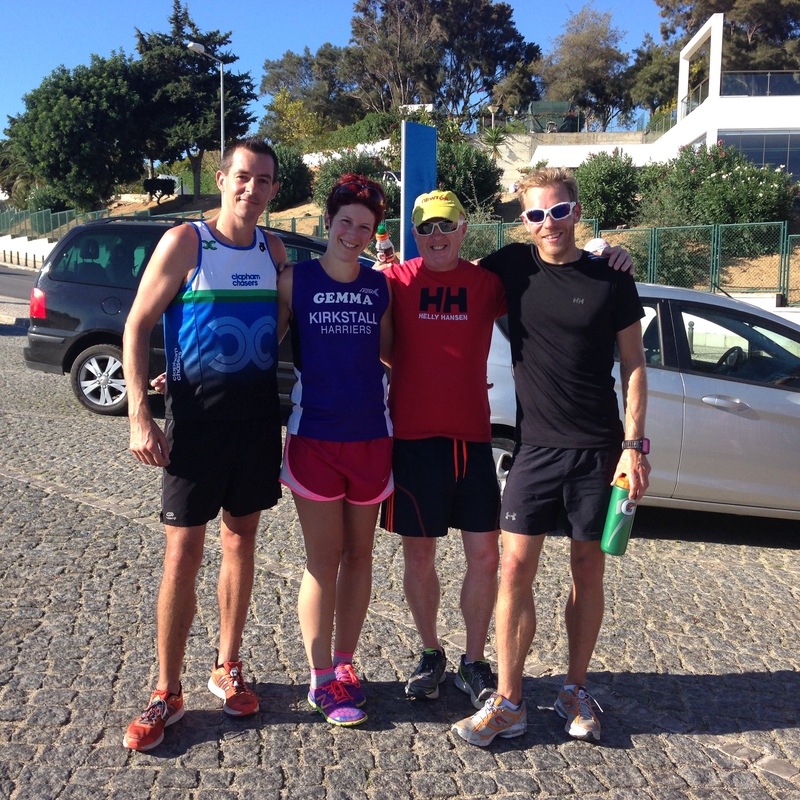 Fellow runners arrived throughout the afternoon and we got to know each other and coaches Alan, Neil and Andy. We were a mixed bunch of ages, running background, ability and goals and we got on like a house on fire. We had our first run before tea – a few miles down to the marina and back up the hill – which was a lovely way to get our bearings. 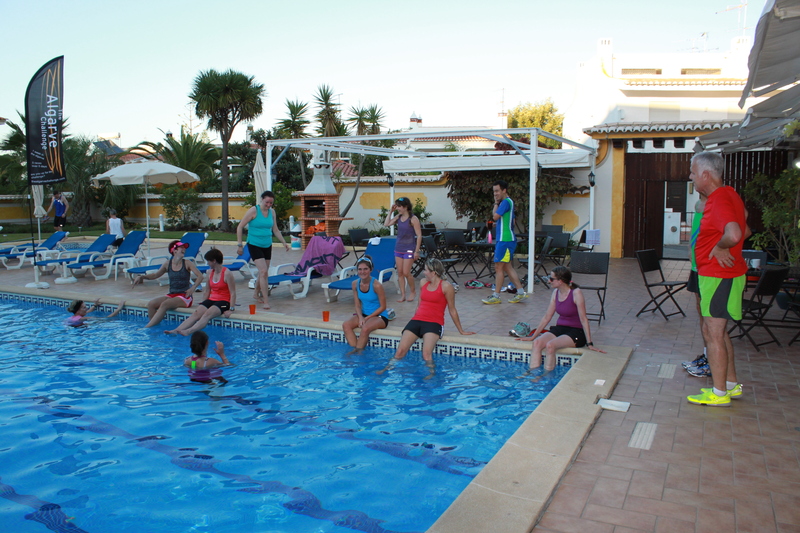 Even at 6pm it was sweaty and sticky, and it wasn’t long before we realised the best way to cool off was to jump in the pool. Fortunately we still had had enough of our wits about us to remove shoes and Garmins first. Two runs a day is nowhere near as bad as it sounds when you get five hours in between to relax on the beach/by the pool. Food is plentiful. And very tasty. I had at least two helpings every evening. Running barefoot along warm sand is one of the most joyous things in the world. Portugal has some beautiful trail routes. But also some amazing beaches and cool shores to ease the achey legs. 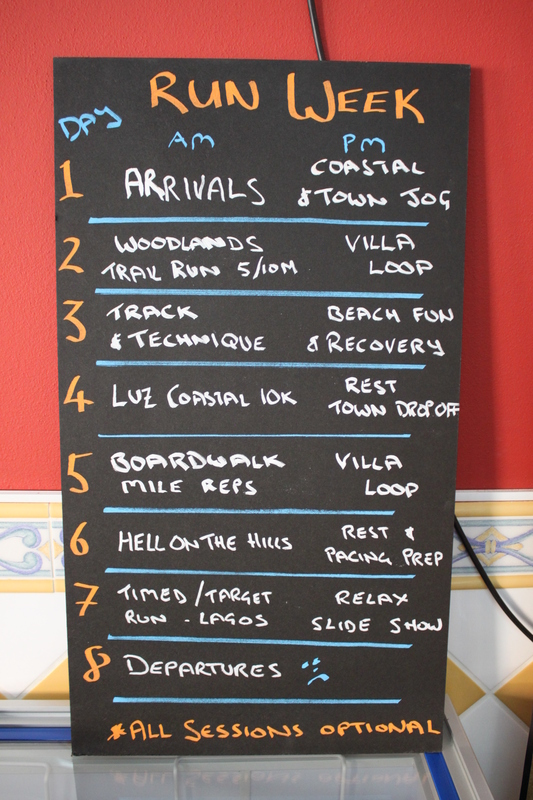 Living with 21 other runners in a villa complex for a week is more crazy than the Big Brother house. Wildlife count: one lizard, three cats, half a dozen dogs, one gannet, two elephants, one massive spider hiding in a sun lounger, many fish. I make an excellent pool volleyball umpire. Advice, guidance and support were never in short supply. We all got some great tips from the coaches on improving our technique and pacing ourselves for target distances. Plus pep talks, hugs, jokes, cheers and jeers. Songs of the holiday – Duality by Slipknot and La La La by Naughty Boy. Word of the week – Benzi. Which can mean anything you want it to mean. 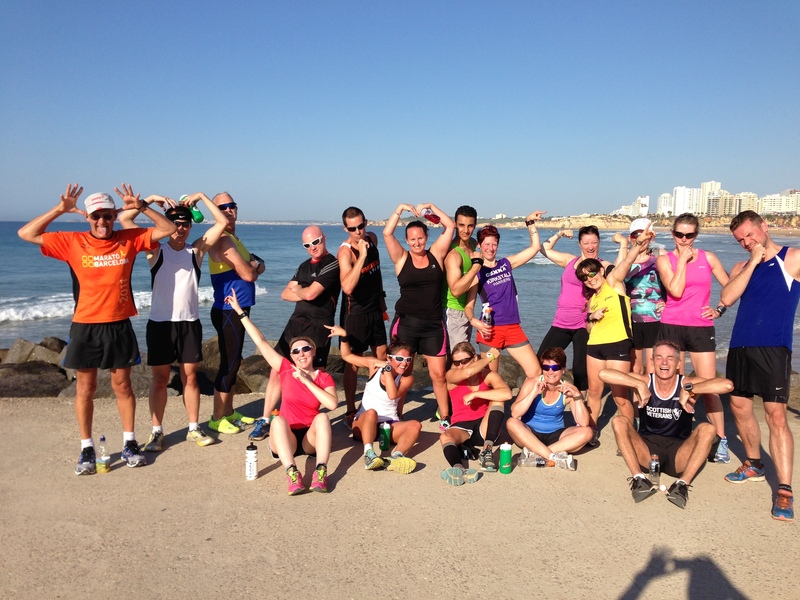 My best run: Boardwalk mile reps on day 5. Fast, fun and fricking tiring! 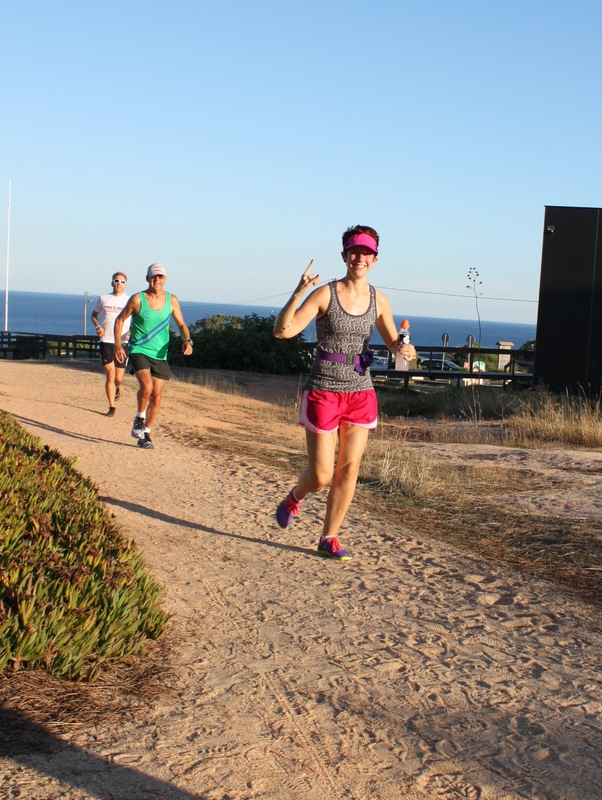 In short: go on an Embrace Sports training holiday! My aim was to come back tanned and a better/quicker runner and I have won on both counts. It was also incredibly beneficial for my state of mind and has given me a massive dose of sunshine to see me through the winter months. Benzi!